So recently my scalp has been extremely dry thanks to eczema so I made a little Feel Unique order. Originally I wanted to repurchase the Moroccan Oil Dry Scalp Treatment but when I came to making the order it wasn't in stock. Not wanting to wait a couple of weeks I decided to give the Fushi Scalp Soother Oil a try. If it doesn't work then I'll order the Moroccan Oil version when it's back in stock. Jojoba, Evening primrose oil, Sweet almond oil, Borage oil, Vitamin E, Bergamot, Chamomile and Wild carrot are included in the list of ingredeients to hydrate and nourish the scalp. Here's to hoping after a couple of uses all dry patches will have disappeared. I'll post a full review of it in a couple of weeks. 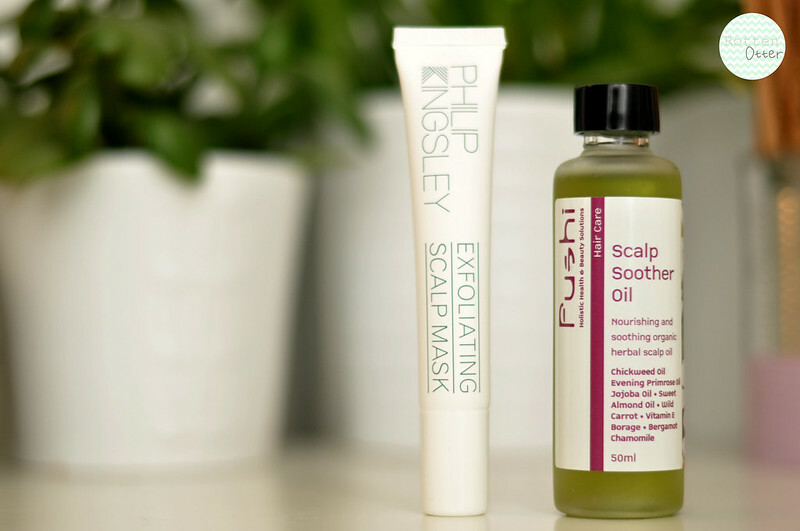 A repurchase is Philip Kingsley Exfoliating Scalp Mask, another product I'm hoping will help my dry skin as it made a difference a couple of months ago. Unlike the name suggests, it doesn't contain exfoliating particles which I was a bit wary of when I first bought it as I thought that might irritate my scalp. Instead, it's a cream which you apply all over your scalp with damp hair, leave for 10 or 20 minutes and wash as normal. Any other products for dry scalps that I need to try?